New rules for solid waste landfills are expected to reduce methane emissions by 334,000 tons a year beginning in 2025- the equivalent of reducing 8.2 million metric tons of carbon dioxide, according to a recent press release from the EPA. Municipal solid waste landfills are the second-largest industrial source of methane emissions in the United States, according to the EPA, and accounted for 20 percent of methane emissions in 2014. To reduce this number, certain landfills will soon be required to install and operate a gas collection control system within 30 months after gas emissions reach 34 metric tons of non-methane organic compounds or more per year. The previous threshold was 50 metric tons per year. The new rules will apply only to landfills constructed, modified or reconstructed after July 17, 2014, with a capacity of 2.5 million metric tons and 2.5 million cubic meters of waste or more. To learn more about EFS’ landfill services, click here. Contaminated soil excavation involves taking soil from a contaminated site for above-ground treatment or disposal at a landfill. 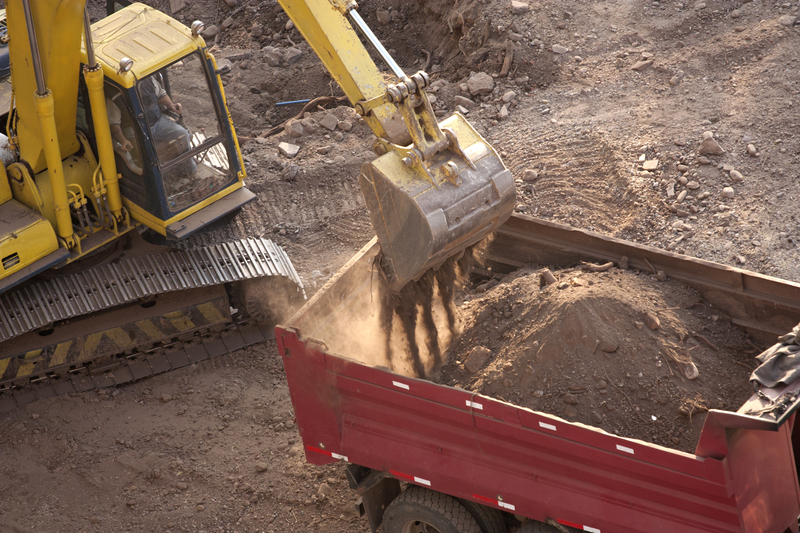 While this excavation can usually just involve soil, it may also require the removal of old drums, buried debris, or other contaminated items. By taking the precaution to move extra items to ensure individuals safety, a simple task becomes extremely important. To learn more about how EFS can help you in this area, Click Here. EFS Service Areas – Did You Know? #DidYouKnow EFS provides complete and innovative remediation services for addressing contaminated sites. Our remediation services include: demolition; excavation, transportation and disposal of contaminated soil; construction and installation of in-situ remediation systems including SVE, groundwater pump and treat and air sparging; applications of HRC®, ORC® and chemical oxidation technologies; and slurry wall construction. To learn more about EFS/ Remediation and Construction Services, click here. To date, EFS has completed approximately 4,000 environmental projects ranging from direct push sampling to facility decommissioning and demolition. Below is a case study on one of their previous projects. EFS was contracted to perform Small Arms Firing Upgrades at the United States Coast Guard Integrated Support Command (USCG – ISC) Base in Portsmouth, Virginia. The project was performed under a contract with Readiness Management Support LLC under the United States Air Force AFCAP contract. EFS was retained to perform lead remediation and clean construction services at the site. Initially, EFS excavated, transported and properly disposed of lead-contaminated soil, and demolished and disposed of the former firing range backstop structures. Additionally, EFS performed complete firing range upgrades at the site. Installing new storm water control features at the site including concrete storm water control basins, reinforced concrete piping, 120-feet long x 30-feet wide retention pond, rip rap, etc. EFS provided HAZWOPER and lead worker trained personnel to perform the scope of work. All work activities were performed in strict accordance with the Occupational Safety and Health Administration (OSHA), U.S. Coast Guard, Virginia Department of Transportation (VDOT) and local regulation. This project was a highly visible and active site and all work activities were performed by EFS without any lost time incidents. To date, EFS has completed approximately 4,000 environmental projects ranging from direct push sampling to facility decommissioning and demolition. Here is a case study on one of their previous projects. EFS was contracted to perform decontamination, demolition, and removal services at the former Indiana Steel and Wire Facility located in Muncie, Indiana. The project was performed in conjunction with an Agreed Order with the Indiana Department of Environmental Management (IDEM) for the site. EFS was retained to perform work activities in five specific areas of the facility including: Oil Temper, Cleaning House, Leach Plant, Galvanizing and Electroform areas. EFS performed work activities at the site for approximately 12 continuous months. All work activities were performed in strict accordance with the Occupational Safety and Health Administration (OSHA), Indiana Department of Environmental Management (IDEM) and City of Muncie regulations. EFS performed this project utilizing a 3,500 gallon vacuum truck and heavy equipment owned by EFS. All work activities were performed in Level C PPE with lead monitoring of all personnel. EFS provides complete and innovative remediation services for addressing contaminated sites. Our remediation services include: demolition; excavation, transportation and disposal of contaminated soil; construction and installation of in-situ remediation systems including SVE, groundwater pump and treat and air sparging; applications of HRC®, ORC® and chemical oxidation technologies; and slurry wall construction. EFS assists clients in all areas of waste management for RCRA, TSCA and non-hazardous wastes. These services include waste characterization, disposal coordination, tank cleaning, baghouse and scrubber maintenance, facility decontamination, demolition, spill response and drum management. All EFS personnel have completed 40 hours of hazardous waste operations health and safety training in accordance with Occupational Safety and Health Administration (OSHA) regulations to participate in these activities.